If you don’t want to get your hair wet, yet you’ve decided that a cool sea breeze blowing gently against your face is just what you need, discover the breathtaking coastline of Crimea from the turquoise sea. Yalta is a great base for embarking on everything cruise-related. One of the most popular destinations is Swallow’s Nest – a must-visit landmark of Crimea – so unsurprisingly many boats take tourists there. The most popular time to go is at sunset when it can get pretty crowded. Balaklava, just a short drive from Sevastopol, is a quaint little bay full of yachts and history and is sometimes dubbed the “Crimean Riviera.” Motor or sail boat tours last 30 minutes (just a quick trip around the bay), two hours (guided excursion to places like Cape Fiolent or Cape Aya with time for a swim) or up to six hours, where you and your friends will sail up and down the coast, have a chance to swim, visit a wild beach and enjoy a delicious “shashlyk” (barbecue) meal prepared especially for you. Kerch, Alushta, Feodosia and Sevastopol are also great starting points for boat tours. Unlike the Great Barrier Reef or the Maldives, the bottom of the Black Sea boasts relics from ancient times, making it a great destination for wreck diving. Recently the media has shared reports on divers discovering a ship dating back to the Byzantine era just outside Sevastopol or about President Putin resurfacing with two ancient Greek jugs after diving in Taman Bay. Cape Tarhankut has different depth levels along the coast where you can find many interesting wrecks, including the “Alley of the Leaders,” a unique underwater museum with dozens of busts of Soviet leaders. The coast and bottom relief of Balaklava Bay is one of the most beautiful ones in the Crimea, with rocky formations creating unique underwater grottoes and caves with a diameter up to 10 meters. Nearly every resort city on the peninsula has its own water park but Evpatoria’s “Banana Republic” is the largest of them all and can accommodate up to 2,500 people simultaneously. In total, there are 25 rides and eight pools, as well as tennis courts, massage chairs, fast food cafes and restaurants. “Almond Grove” in Alushta is not just a water park, but also an entertainment complex that includes a hotel, restaurant and water sports zone with six pools, 14 water slides and a jacuzzi. You can also find water parks in Simeiz, Sudak and Sevastopol. Lay back, enjoy the scenery and take a refreshing dip at one of Crimea’s beaches. Though a typical Crimean beach is a crowded and lascivious affair where food, people and water blend together, it is possible to avoid the throngs of (mostly) Russian tourists by either traveling in the shoulder season (late April until May) or arriving in September or October to enjoy the quiet peace of late summer. Yalta is considered to be the main tourist destination in Crimea, but their beaches are extremely crowded, pebbly and rough on the feet. The views here are also not nearly as spectacular as they are in other places. Instead, rent a car and head east towards Feodosiya and set up camp at the picturesque sandy beaches of Noviy Svet, Koktebel, Mysovoe or Shirokaya Bay. Another alternative is to set off from Sevastopol and spend a fantastic day by the sea at Laspi’s or Batiliman’s beaches or enjoy a refreshing swim in the rolling, blue waves of the Black Sea after checking out the Greek ruins of Chersoneses, which date back to 5 B.C. 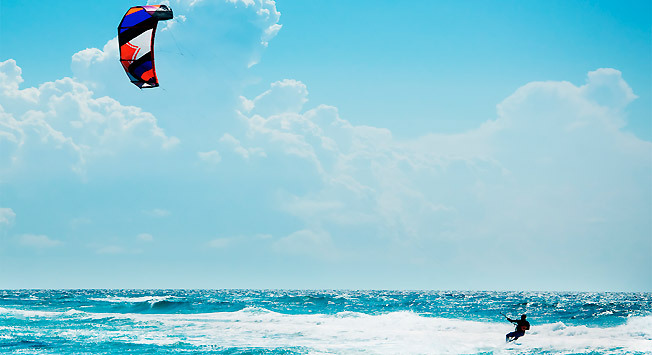 The windsurfer’s main places of interest in Crimea are located in and around Sevastopol, where most of the schools, clubs and competitions are located. Other popular spots with strong winds are the waters off Evpatoria, Sudak, Tarkhanut and Cape Kazantip.